It is hygienic to actually have a toothbrush holder, rather than to leave your toothbrush hanging around in one place on the sink, exposing it to the mercies of it dropping to the floor by accident, or perhaps letting an insect crawl all over it. Sure, the toothbrush holder might not prevent both scenarios from happening either, but it does help lower the chances of them working out. Since you are in the market for a toothbrush holder, you might as well go all out and have a hoot while you are at it – with the $9.99 Rain & Shine Toothbrush Holder, of course. 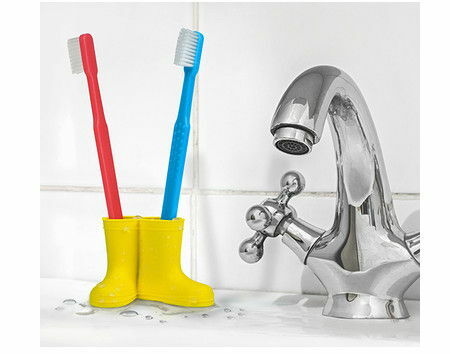 This is the perfect toothbrush implement, rain or shine, as the charming little wellies ensure that your toothbrushes remain safe at hand all the time, and will hold a pair of toothbrushes in pure non-toxic, BPA-free silicone.